Peel squash. Halve lengthwise. Remove seeds and discard. Cut squash into 3/4-inch pieces. 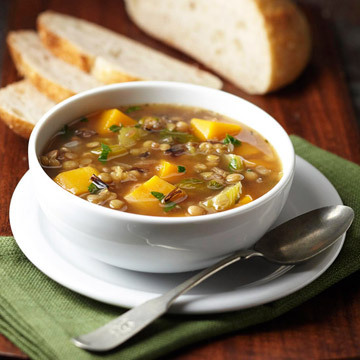 In a 5- to 6-quart slow cooker, combine squash, onion, celery, lentils and wild rice. Stir in broth, onion soup, water, thyme and pepper. Cover slow cooker; cook on low-heat setting for 7 to 8 hours or on high-heat setting for 3-1/2 to 4 hours. Just before serving, stir parsley and, if you like, dry sherry into mixture in slow cooker. Makes 6 main-dish servings.